The function of excretion in insects is performed by the Malpighian tubules, a functional equivalent of the vertebrate kidney. Malpighian tubules are long, thin tubes connected to the hindgut. Upon the determination of the Malpighian tubule major cell type early in embryogenesis, the tubular architecture is achieved by extensive cell division and cell rearrangements. During the tube elongation process, cells exchange their neighbors, allowing the short and fat Malpighian tubule primordia to grow and become a thin tube. Cell rearrangement and intercalation underlie the morphogenesis of other epithelial tissues in Drosophila melanogaster, such as the embryonic epidermis. Recent work has provided insights in the cellular and molecular basis of cell intercalation. These advances are reviewed and discussed with regard to what is known about Malpighian tubule morphogenesis. Mature Malpighian tubules are composed of two cell types, each having a specific function in excretion: The principal cells and the stellate cells. Drosophila and mammalian kidney development show striking similarities, as the recruitment of the stellate cells to the Malpighian tubules, like the cells of the metanephric mesenchyme, requires that cells undergo a mesenchymal-to-epithelial transition. The molecular similarities between these two cases is reviewed here. Tubular organs are a particularly important feature of metazoans, because the formation of tubes results in an increased surface area for interaction with the environment, allowing efficient gas and fluid exchange and thereby facilitating homeostasis. Several tubular organs have been described in higher organisms, such as the lung, the kidney, the liver, and the pancreas. Tubular structures are also found in insects and include the salivary glands, the tracheal system, and the Malpighian tubules, a functional equivalent of the mammalian kidney. Tubulogenesis of these organs occurs during embryonic development and requires the integration and coordination of various cellular events such as cell division, cell migration, cell intercalation, and cell shape changes. These processes allow the budding and growth of tubes from a monolayered epithelium, ultimately leading to a functional, often heavily branched epithelial network (for review, see references 1–3). Given the high degree of complexity of the regulatory mechanisms that control tubulogenesis in mammals and taking into account the conservation of regulatory pathways in higher and lower animals, it is expected that studies in simpler and genetically more tractable model systems, such as Drosophila melanogaster and Caenorhabditis elegans, will contribute to our understanding of the molecular and cellular details of tubulogenesis. In this review, we first provide a general description of the development of the Malpighian tubules during Drosophila embryogenesis and highlight a number of striking cellular and molecular parallels between this model system and the development of the vertebrate kidney. We then discuss some recent data on the genetic control of cell rearrangement during epithelial remodeling in the Drosophila epidermis and assess how emerging ideas from study of this system are relevant to Malpighian tubule development. Some of the paradigms discussed in the context of the Malpighian tubules might also apply to the mammalian kidney. This might help to design novel experimental approaches and ultimately lead to a better understanding of kidney development. The Malpighian tubules of the Drosophila larva consist of two pairs of epithelial tubes (Figure 1H) that bud from the hindgut during embryogenesis (Figure 1, A and B). These buds grow in a stereotyped manner, the longer ones in the direction of the head of the embryo, the shorter ones toward the posterior end (Figure 1, C through E). At the onset of the budding, the Malpighian tubule primordia consist of six to 10 cells wrapped around the primitive lumen (Figure 2, B through D). By the end of embryogenesis, the Malpighian tubules have developed into long, thin tubes, with two cells encircling the lumen (Figure 2F) (3). Four different steps underlying these dramatic morphogenetic events can be distinguished: Allocation of the Malpighian tubule primordia, tube budding, tube growth and elongation, and, ultimately, cell differentiation (for excellent and comprehensive reviews, as well as for more specific references, see references 3,4). 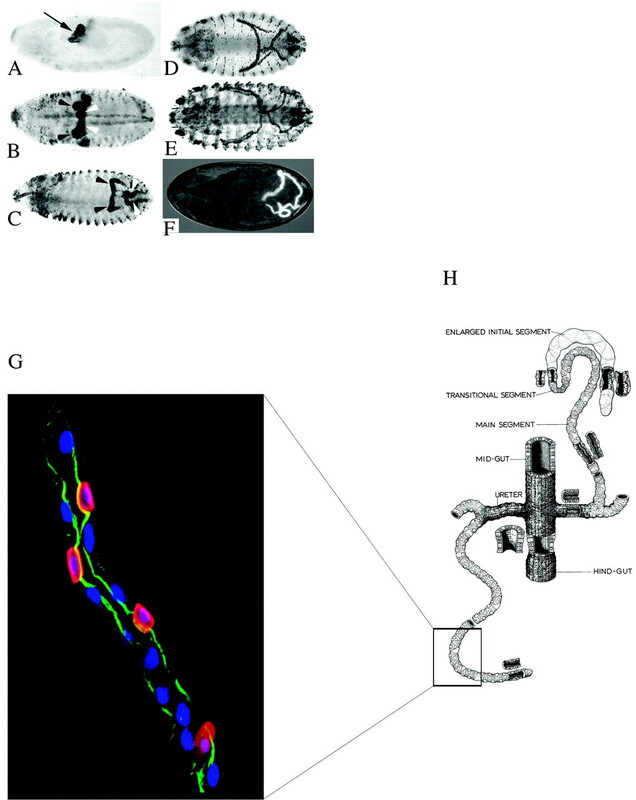 Embryonic development and anatomy of the Drosophila melanogaster Malpighian tubules. (A through E) Drosophila embryos stained with an antibody raised against the transcription factor Cut, which labels tubule cells throughout development. (A) The tubules evert from the hindgut early in embryogenesis. (B through D) The tubules grow first by cell division (B and C) and later by elongation through cell intercalation and rearrangements (D). (E) Later, the tubules have adopted their stereotyped arrangement within the embryonic cavity. (F) By the end of embryogenesis, the first signs of physiologic activity can be seen as uric acid is deposited into the tubules lumen (revealed as a bright deposit under polarized light). Embryos are shown in lateral view (A) and in dorsal view (B through F), with anterior at left and posterior at right. Black arrowhead, anterior tubule; white arrowhead, posterior tubule. (G) The tubule from a Drosophila larva stained with antibodies raised against the transcription factor Teashirt (Tsh; red) and F-actin (green) and stained for DNA (blue). Stellate cells (SC) are interspersed with principal cells (PC). SC originate from a different cell lineage than PC and express Tsh. Both cell types adopt apicobasal polarity, as demonstrated by the accumulation of F-actin in the microvilli on the luminal side of the cells. (H) Schematic representation of the larval Malpighian tubules in Drosophila. Drosophila has four tubules, a longer anterior and a shorter posterior pair (one tubule of each pair is depicted). They originate at the midgut-hindgut boundary. Each tubule can be divided into four distinct morphologic regions, based on proximodistal differences in cell structure: initial, transitional, and main segments and the ureters. Schematic representation of the different events underlying Malpighian tubule development. (A) Allocation of Malpighian tubule cells. Early in embryogenesis, interaction between the midgut (red) and the hindgut (blue) anlagen, through signal(s) of unknown identity, refines the domain of expression of the Krüppel (Kr) transcription factor in the hindgut (green) to the future Malpighian tubule PC. Kr is involved in maintaining the expression of the Cut transcription factor. The wingless pathway is thought to play a permissive role in Malpighian tubule cell allocation in parallel to Kr and Cut. (B) Eversion of Malpighian tubules. As a consequence of Kr and Cut expression, Malpighian tubule cells change shape and the tubule primordia evert from the hindgut. The morphogenetic programs triggered by Kr and Cut are not known. (C) Determination of the tip cell. Within the tubule primordia, a new cell lineage is produced (dark blue). A cell called the tip cell (yellow) is singled from this group of competence cells via the Notch pathway. (D) Tubule growth by cell division. Once the tip cell has differentiated, it secretes epidermal growth factor (EGF) and stimulates mitosis in neighboring cells, at the distal end of the tubule. As a consequence, tubules grow by addition of new cells. At this stage of development, the tubule is short and fat, with six to ten cells encircling the lumen. The tubule comes in vicinity to the caudal mesoderm (orange). (E) Tubule growth by cell intercalation. Malpighian tubule cells stop dividing, and tubule growth proceeds through extensive cell rearrangements and intercalation. Subsequently, the diameter of the lumen starts to decrease. 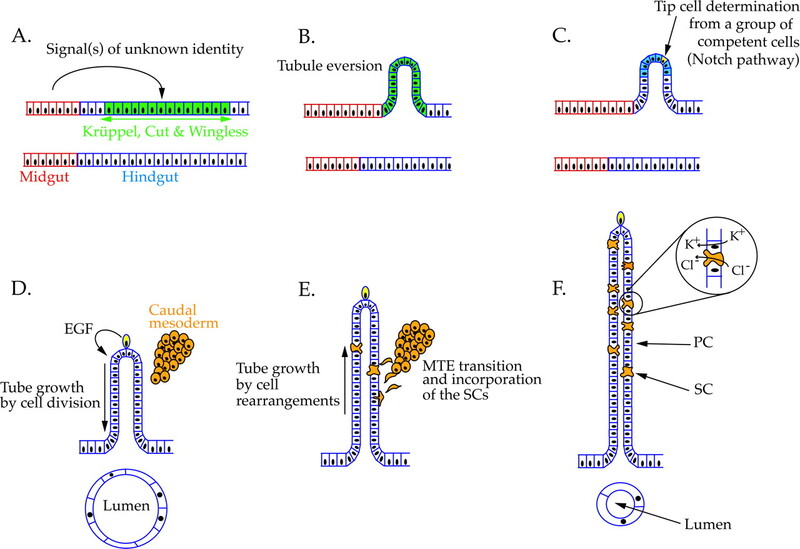 During this phase, a subpopulation of caudal mesoderm cells interacts with the tubule; individual cells undergo a mesenchymal-to-epithelial transition (MTE) and progressively incorporate into the tubule epithelium as SC. (F) Functional Malpighian tubules. By the end of embryogenesis, Malpighian tubules have achieved their final architecture. They have undergone a dramatic increase in length and have become very thin, with just two cells around the lumen. They are then functional: PC transport K+ into the lumen, and SC, interspersed with PC, allow the consequent movement of Cl− and water. Malpighian tubules originate from the hindgut, which itself results from an invagination of the posterior ectoderm (Figure 1A). An interaction between the midgut and the hindgut is a key step in the allocation of the major Malpighian tubule cell type, the principal cells. An unknown signal from the midgut specifies Malpighian tubule fate by refining the expression of the zinc-finger transcription factor Krüppel (Kr) to the future Malpighian tubule cells. Kr in turn helps to maintain the expression of the homeodomain-containing protein Cut in the same domain (Figure 2A). In addition to this putative inductive signal(s) emanating from the midgut, signaling through the Wnt pathway is required at this early stage for the normal specification of tubule cells. wingless (wg) is expressed in the inner-most region of the proctodeum, where tubule cells arise (5), suggesting that wg pathway activity could be a permissive signal for tubule cell allocation (Skaer et al., in preparation). As a consequence of the presence of the Kr and Cut transcriptional regulators, Malpighian tubule cells undergo complex cell shape changes, and tubules start to evert from the hindgut (Figures 1B and 2B). In Kr and cut mutant embryos, tubules do not bud, and the cells either remain in the hindgut or form multilayered blisters on the surface of the hindgut, respectively (6–9). However, Kr and Cut are not solely required for Malpighian tubule cell fate determination, as cells with Malpighian tubule–like characteristics (e.g., expression of tubule-specific markers in the Malpighian tubules primordia, or accumulation of uric acid, the nitrogenous waste, in the lumen) can still be found in the hindgut in embryos mutant for either locus. The genes regulated by Kr and Cut, which drive morphologic rearrangements that lead to tube eversion, are not yet known, and their isolation represents a major goal in the field. These target genes are likely to encode molecules that regulate the cytoskeleton, modulate cell junctions and adhesion, and direct cell movement and cell shape changes. Strikingly, the mammalian transcription factors Glis2 and Klf-6, belonging to the Krüppel-family, as well as Cux-1, the mammalian ortholog of Cut, have been shown to play a role in kidney development (for review, see reference 10 and references therein). However, their speculated role in early as well as late kidney specification and maturation is not yet understood. It is remarkable to note that both in mammals and in Drosophila, the Wnt signaling pathway plays an inductive role in kidney development. Indeed, knockout mice lacking a functional copy of the Wnt4 gene develop small, dysgenic kidneys, in which a poorly differentiated metanephric mesenchyme is interspersed with uteric branches (11) (for reviews, see references 12,13). Similarly, the DWnt pathway, in addition to its role in tubule specification, seems to play a crucial role in determining Malpighian tubule cell number (3,4). While the tubules are budding, one cell at the tip of the branches is singled out of a competence group by lateral inhibition through the Notch pathway (Figure 2C) (14,15). This tip cell secretes epidermal growth factor (EGF) and promotes cell division by activating the EGF receptor pathway in its neighbors (Figure 2D), thereby inducing tubule growth by increasing the cell number. Cell division ceases by mid-embryogenesis, and at this stage, the tubules begin to undergo a dramatic phase of elongation, brought about by cell intercalation (Figure 2E). During this period, the tubules increase considerably in length (Figure 1, C through E), and the number of cells surrounding the lumen drops from six to ten to just two (Figure 2F) (3). Several genes implicated in these concerted and organized cell rearrangements have been identified. Not surprisingly, the Drosophila homologue of the nonmuscle Myosin II heavy chain, encoded by the zipper locus, plays a role in the Malpighian tubule cell shape changes and rearrangements that underlie tube elongation (16,17). A similar role in regulating cell shape changes has been proposed for the ribbon gene, which encodes a BTB/POZ domain protein, perhaps through its ability to regulate the transcription of genes encoding components or modulators of the actin cytoskeleton (16,18,19). Yet the precise role of these genes in tubule elongation is not understood at the moment (3), and the molecular processes by which it is orchestrated remain mysterious. However, important advances have been made recently in the understanding of cell rearrangement in the epidermis in Drosophila during gastrulation, and we briefly discuss these studies and their possible relevance for Malpighian tubule development in the last section. Once the Malpighian tubule cells exit the proliferation program, they grow by regulated endoreplication. Patterned cell differentiation results in the onset of the physiologic function of the tubules by the end of embryogenesis, which can be monitored by the appearance of uric acid in the lumen (Figure 1F). This excretion function of the Malpighian tubules relies on the presence of two different categories of cells: Approximately 484 principal Malpighian tubule cells (PC) interspersed with approximately 110 stellate cells (SC; Figures 1G and 2F) (20). Primary urine production relies on the combined activity of the PC, which secrete K+ into the lumen by a vacuolar-H+-ATPase transporter and K+/H+ exchanger (21,22), and the SC, which express channels to permit the consequent flow of chloride ions and water (23,24). In insects, the activity of these transporters is hormonally regulated by diuretic peptides (for review, see reference 25). Again, very little is known about the genetic control of cell differentiation, and future experimental efforts have to be launched to close the link between the establishment of the primordium and the final differentiation and function of the cells that make up the Malpighian tubules. It was long thought that all of the cells that make up the Malpighian tubules derive from the ectodermal invagination that also gives raise to the hindgut. However, Denholm et al. (20) recently showed that PC and SC derive from distinct cell lineages. By injecting genetically labeled nuclei into early embryos, they observed that these nuclei were incorporated in 91% of the cases either in the PC or in the SC and only rarely in both cell types. These results argued in favor of a distinct origin for the SC and their recruitment to the Malpighian tubules. Using a technique to mark indelibly cells that express a particular gene, it was shown that SC come from a cell population that expressed twist, a gene predominantly expressed in the mesoderm, suggesting that the SC have a mesodermal origin. Further experiments using the same technique mapped the origin of SC to a population of mesoderm called the caudal mesoderm (a subset of the embryonic mesoderm, in the posterior region), which overlies the hindgut exactly at the location where Malpighian tubules bud from the hindgut. The caudal mesoderm cells express markers, such as the transcription factor Teashirt (see Figure 1G), which are maintained in the SC as they get associated to the developing tubule and incorporate into the Malpighian tubule epithelium. These markers are never expressed in PC. Despite their mesodermal origin (20), SC adopt epithelial characteristics once they have incorporated into the tubules and develop an apicobasal polarity, evident by the expression of specific apical membrane markers and by the development of polarized cell architecture (microvilli on the luminal surface  and a polarized actin cytoskeleton). Thus, Denholm et al. proposed that while the prospective SC are recruited from the caudal mesoderm into the growing Malpighian tubules, they undergo a mesenchymal-to-epithelial transition. Here, a very striking parallel can be drawn with the development of the vertebrate kidney. Indeed, the formation of the vertebrate kidney relies on the continuous interaction between the uteric bud, which branches from the Wolfian duct and will later give rise to the urine collecting system (collecting ducts and ureters), and the metanephric mesenchyme, which will form the glomeruli and the nephrons (for review, see reference 12). In this case as well, cells of the metanephric mesenchyme undergo a mesenchymal-to-epithelial transition, aggregate around the uteric bud and adopt epithelial features. It is interesting that Denholm et al. provided genetic evidence in favor of additional conservation of similar mechanisms for the development and function of the kidney in mammals and Drosophila. Nephrins are proteins that belong to the Ig super family of cell surface molecules. The vertebrate Nephrin is expressed in the slit diaphragm, a key component of the filtration system of the glomeruli (26). Patients who carry a defective nephrin gene lack the slit diaphragm and experience a life-threatening congenital nephrotic syndrome characterized by massive proteinuria (27). Drosophila embryos mutant for the hibris locus, which encodes the ortholog of vertebrate Nephrin, show a significantly reduced number of SC, and, as a consequence, the relative rate of fluid secretion of Malpighian tubules is decreased in this mutant (20). The precise role of Hibris in SC development is not yet understood. However, one possibility is that Hibris interacts with other Nephrin-like molecules, which might be expressed at the surface of the PC and help to stabilize the interaction of the SC and the Malpighian tubule epithelium. In both cases, the absence of a functional copy of the Nephrin gene results in a failure of the proper development and physiologic function of the organ. Although the Malpighian tubules and vertebrate kidney are very different in both structure and physiology, these results reveal exciting cellular and molecular similarities. These data suggest that knowledge derived from simple model systems, such as the Drosophila Malpighian tubules, will provide useful clues concerning the role of the cellular factors involved in the development of more complex organs and ultimately lead to a better understanding of the disease. One essential and fascinating aspect of tubulogenesis, common to most tubular organs, is the restructuring of tube architecture by cell rearrangement and cell intercalation during elongation, a process in which cells dynamically exchange their neighbors. As mentioned previously, Malpighian tubules adopt their final thin morphology through cell intercalation, starting from a short, fat tube and ultimately forming a long, thin tube in which two cells encircle the lumen. However, this process is poorly characterized in the context of the Malpighian tubules, and the precise role of the few molecular components that are known to be involved in the process is not well understood. Does cell intercalation in tubular structures, such as the Malpighian tubules, occur in a manner similar to cell intercalation in other tissues? A recent study has provided novel and exciting insight into both cellular and molecular aspects of cell rearrangements. In the following section, we describe the results of this study and discuss them in the light of Malpighian tube development. We expect that these novel results will have an impact on the experimental strategies used in studying Malpighian tubule development and will allow for a better understanding of the processes involved in its morphogenesis. Several distinct tissue movements occur during gastrulation in insects. One of these, germ band extension (GBE), is a developmental elongation of the embryonic ectoderm along the anterior/posterior (A/P) axis, which results in a nearly twofold elongation of the epithelial layer that forms the thorax and the abdomen of the Drosophila embryo (Figure 3A). This extension is achieved through a convergence movement of epithelial cells, along the embryonic dorsoventral (D/V) axis, from lateral positions toward the ventral midline region of the embryo (Figure 3B). Remarkably, neither cell division nor cell shape changes are responsible for this event; GBE relies solely on cell intercalation. Myosin II-dependent junction remodeling controls polarized cell intercalation of epidermal cells during germ band extension in Drosophila embryos. All panels are shown with anterior to left and dorsal to the top. (A) Schematic representation of a Drosophila embryo at the onset (a) and completion (b) of germ band extension (GBE). The extending germ band is located ventrally and is represented in dark brown. Because of extensive epidermal cell intercalation, the tissue elongates nearly twofold and extends toward the posterior pole of the embryo (arrows in a and b). Insets show intercalation of cells, as outlined in B. (B) Intercalating epidermal cells during GBE. GBE is achieved through a convergence movement of epithelial cells, along the embryonic dorsoventral (D/V) axis, from lateral positions toward the ventral midline region of the embryo. During this process, tetrads of hexagonal cells (marked with a red dot) change over time from a type 1 configuration of adherens junctions (AJ; red) to a type 2 and finally a type 3 configuration. Type 1: cells along the anterior-posterior (A/P) axis are in contact with each other; cells along the D/V axis are not. Type 2: all cells show equal contact. Type 3: cells along the A/P axis are no longer in contact; cells along the D/V axis are now in contact. The progressive transition from a type 1 to a type 3 configuration results in a dramatic increase of the length of the tissue along the A/P axis. (C) Model for planar epithelial intercalation. Myosin II (yellow) is enriched at the level of AJ running along the D/V axis (type 1) and provides the cells with an intrinsic contractile network that forces polarized AJ remodeling. This tension causes shrinking of the type 1 AJ probably by orienting the disassembly of E-cadherin-based junctions (green). Myosin II is absent from the AJ in type 2 and type 3 configuration. Therefore, it is thought that it provides the energy input for the transition of type 1 to type 2 configuration. To visualize cellular events during GBE in live embryos, Bertet et al. (28) marked the epithelial adherens junctions (AJ) using a chimeric Drosophila E-cadherin protein fused to the green fluorescence protein (GFP). Their analysis revealed that during GBE, tetrads of hexagonal cells go from a so-called type 1 junction configuration (adjacent cells along the A/P axis are in contact with each other; cells in the D/V axis are not) to a type 3 junction configuration (cells in the A/P axis are no longer in contact; cells along the D/V axis are; Figure 3, B and C). This process goes through an intermediate type 2 junction configuration, where all cells of the tetrads show equal contact. Therefore, it seems that the extension of the epithelium along the A/P axis is not due to a concerted cell movement but rather to a highly organized remodeling of the AJ that results in the polarized rearrangements of cell neighbors within the plane of the epithelium. This is driven by a sequential change in the configuration of AJ over time (from the type 1 to the type 2 and to the type 3). GBE is incomplete in mutant embryos that lack the function of the Kr transcription factor. Bertet and collaborators showed that although the three types of junction are present in this mutant background, the sequence of their transition is no longer observed. The distribution between type 1, type 2, and type 3 seems to be more random, and “backward” transitions are sometimes observed. In Kr mutants, GBE is incomplete as a result of reduction in organized junction remodeling over time. Where does the force, which leads to the concerted transition of type 1 into type 3 junctions, come from? It seems that Kr is required for the asymmetric recruitment of the Myosin II heavy chain (encoded by the zipper [zip] gene) and the Myosin II regulatory light chain (encoded by the spaghetti squash [sqh] gene), which are enriched along the shrinking type 1 junctions (Figure 3C). In embryos that lack the function of either zip or sqh, epithelial cell intercalation is severely disrupted. The formation of an active Zip/Sqh complex requires phosphorylation of Sqh by Rho-kinase (Rok). Injection of an inhibitor of Rok reduces the recruitment of Sqh to the type 1 AJ and affects GBE in a dose-dependent manner. 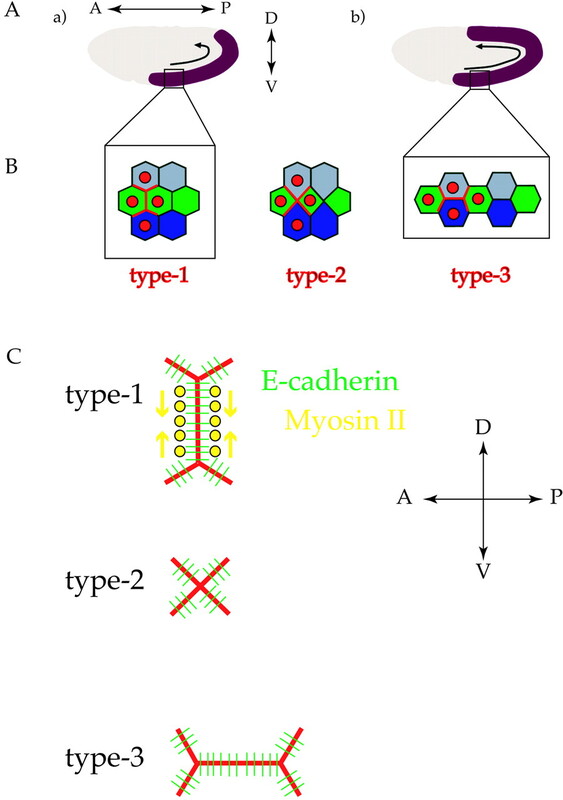 On the basis of these data, the authors propose that the polarized recruitment of Myosin II contractile activity at the level of type 1 AJ creates a local tension that orients the disassembly of junctional E-cadherin complexes (Figure 3C). As a consequence, the polarized intercalation of the cell within the plane of the epithelium leads to the elongation of the tissue (Figure 3B). As mentioned above, a role in Malpighian tubule cell shape changes and tubule elongation has been proposed for Zip, yet the precise action of Zip in this context has not yet been elucidated. Does it act together with Sqh? Does Zip influence the remodeling of AJ in Malpighian tubules? Where does Zip localize in the cells during rearrangement? Those questions should now be addressed, and the results obtained might shed light on how epithelial tubes are remodeled during development. Whereas GBE is controlled by internal forces, the elongation of the branches in the another insect tubular organ, the developing tracheal system, has been proposed to be under the control of external pulling forces exerted by actively migrating tip cells (see reference 29). It is not clear whether cell rearrangements in the growing Malpighian tubules are the consequence of internal and/or external forces. During tubule elongation, the tip cells of the anterior and posterior tip cells establish specific contacts with neighboring tissues. The possible tension in the tubule resulting from the anchoring of the tip cells might serve as an external force and aid cell rearrangements. However, when the tip cells are experimentally removed, Malpighian tubules, although in disarray, reach the stage in which only two cells encircle the lumen (4,15; unpublished data), demonstrating that cell intercalation is not affected to any great degree; thus, tip cell anchoring and the tension that this might provide do not seem to be absolutely required for tubule cell rearrangement. Recent data suggest that the small Rho guanosine triphosphatases (GTPase) Rho and Rac could be involved in tubule elongation (Skaer et al., unpublished). These GTPases are known to be regulators of cytoskeleton organization. These results, together with the implication of the myosin II heavy chain Zip in cell intercalation, argue in favor of an intrinsic force to rearrange the Malpighian tubule cells. Live imaging and protein localization studies can now be combined with genetic studies in Malpighian tubule development, and this should eventually provide a much clearer molecular picture of tubule growth. Because very little is known about tube growth and elongation in mammalian tissues, these studies might elucidate tubulogenesis in more complex organs. The mammalian kidney and Drosophila Malpighian tubules have different general organization and physiology. However, the embryonic development of these organs uses common strategies, such as the interaction of two distinct cell populations, one of which undergoes mesenchymal-to-epithelial transition. Some pathways or molecules involved in the induction of tubulogenesis (Dwnt) or cell differentiation (Nephrin) seem to have been conserved through evolution. Novel tools, including live imaging, have recently opened the door to new fields of investigation and have made possible the study, in vivo, of dynamic processes such as cell intercalation during the morphogenesis of tubular organs (29). Direct observation of cell movements within a developing epithelium will lead to a more complete picture of how cells rearrange and provide a fuller understanding of the molecular components involved. It can be expected that future studies in Drosophila will strengthen our knowledge about the development of the mammalian kidney. Work on the Drosophila Malpighian tubules in the laboratory of H.S. is supported by the Wellcome Trust and BBSRC. Work in the laboratory of M.A. is supported by the Swiss National Science Foundation and the Kantons Basel-Stadt and Basel-Land. We thank Clemens Cabernard and Marc Neuman for critical comments.